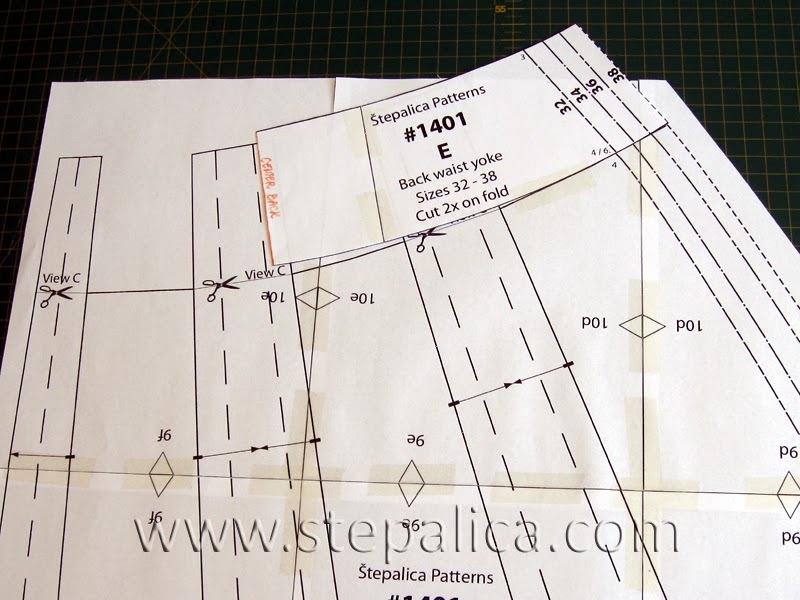 Once the pattern is printed, it needs to be cut in a required size. If your measurements fit perfectly into a single size, you can consider yourself extremely lucky! 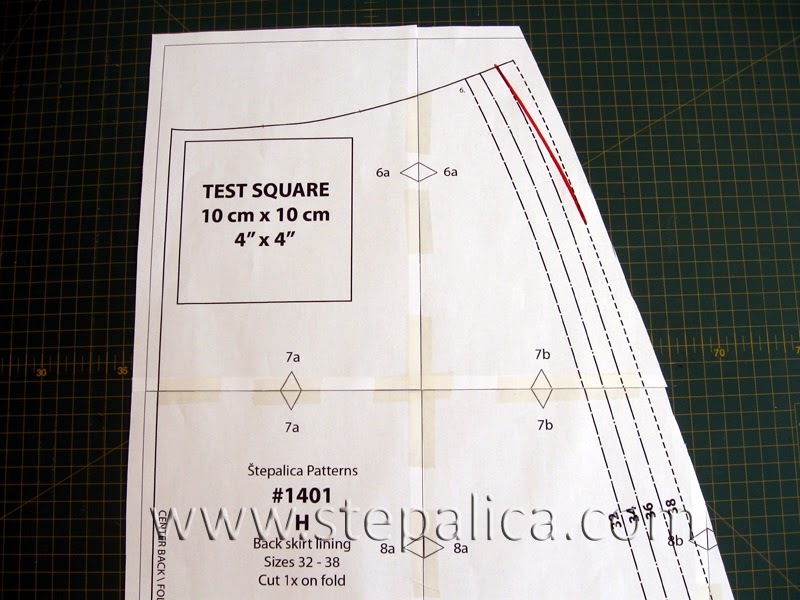 However, if you have hips and waist measurements in different sizes, than you should alter the pattern before cutting your fabric. The alteration itself isn't a very complicated one. In my example, the hips will be size 38 and the waist size 34. First I'll show you the correction of the back panels. Lay the back waist yoke above the back skirt panels, so that the side seams make a smooth line, and the bottom of the yoke is next to the top of the skirt panel. Fix the panels with an adhesive tape so that they cannot move around. Find a spot on your thighs where you're the widest and mark the spot on the pattern. 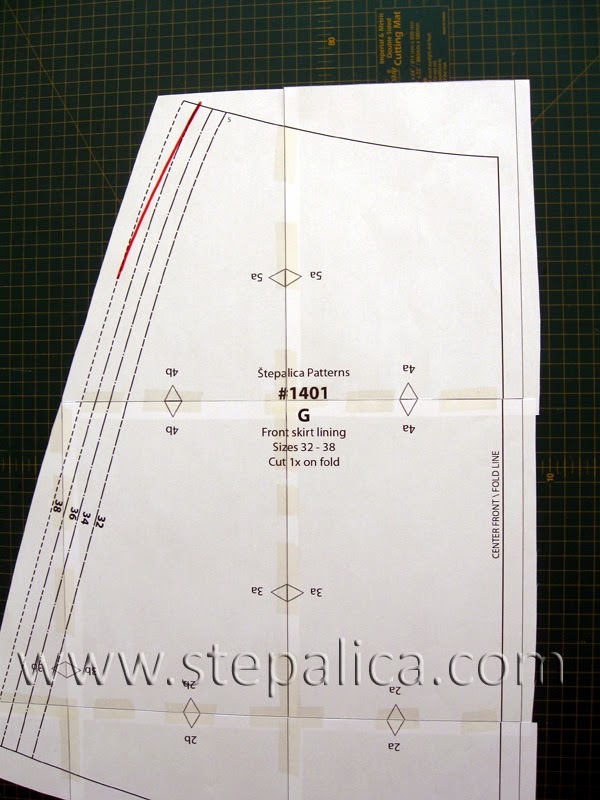 Draw a smooth curve on the pattern, that connects the marked point with the waist line, ending the point in the size 34. Repeat the process on the back lining panel. The same procedure should be done on the front skirt panels. 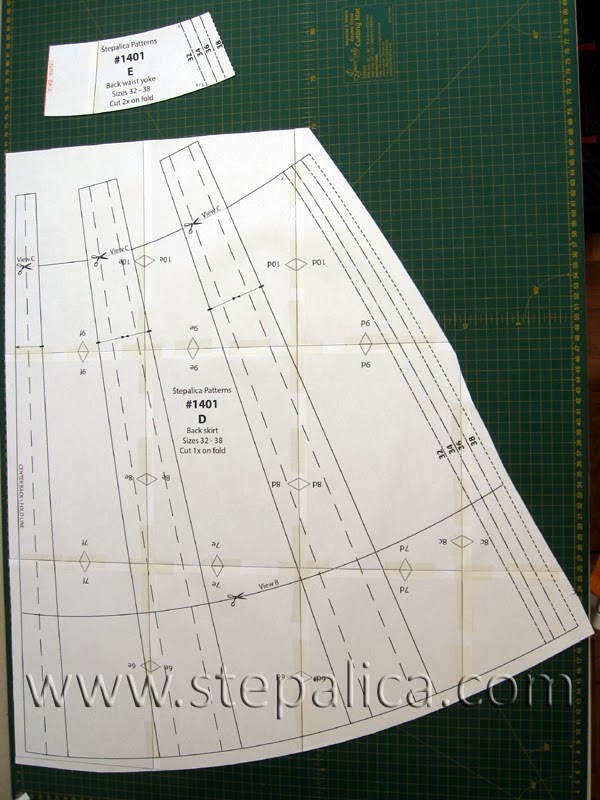 In this case, the alteration will affect the pocket panel as well, so lay the pocket piece over the front skirt panel, so that the side and top edges of the panels align. Add the front waist yoke panel above the skirt panel and fix them in place. Again, draw a smooth curve that connects the size 38 at hips with the size 34 at the waistline. 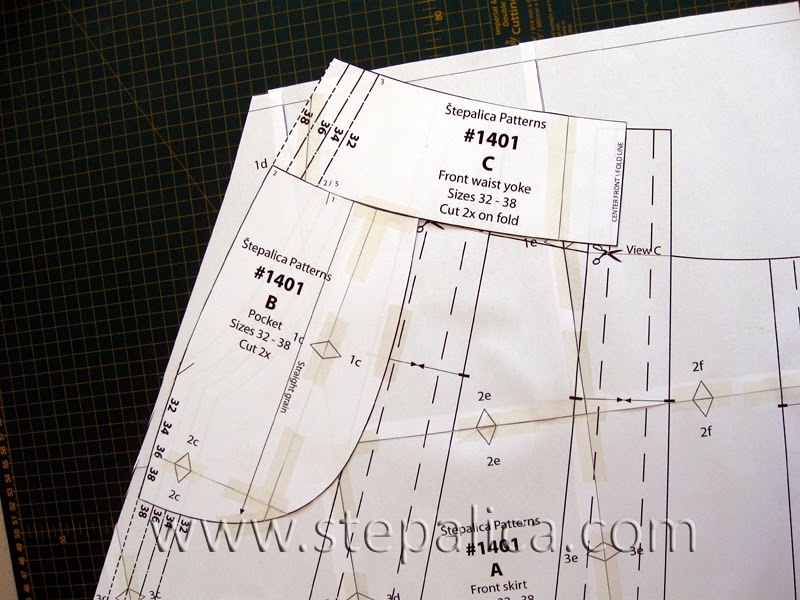 Transfer the alteration from the pocket pattern to the pocket lining panel. 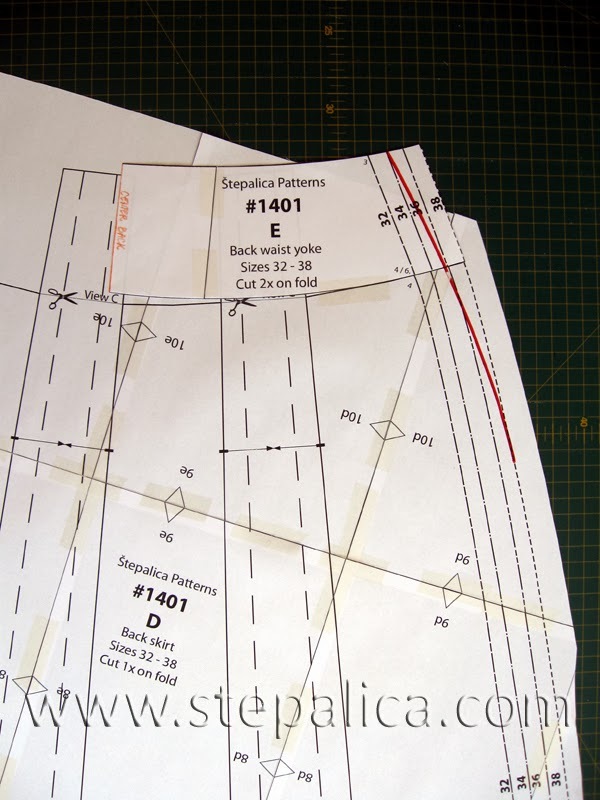 And finally, repeat the procedure on the front lining panel..
Cut the pattern panels according to the corrections you've just made. 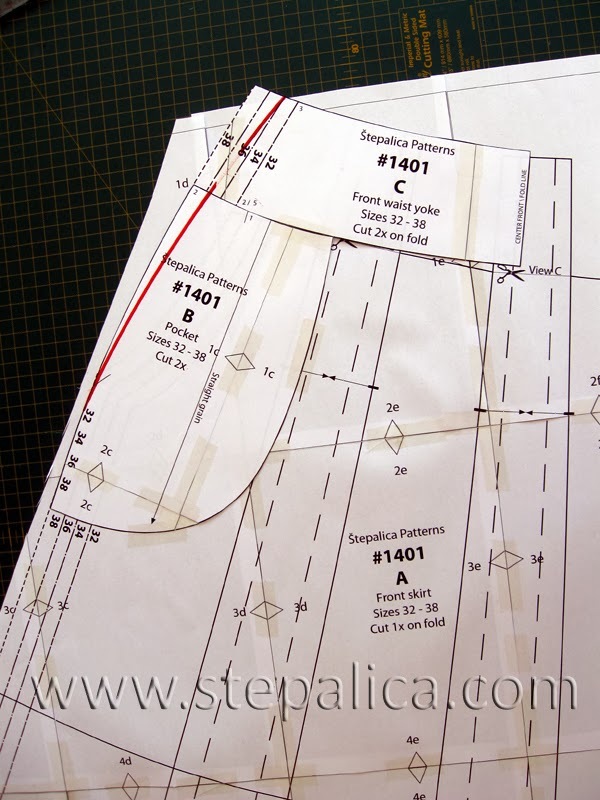 Tomorrow we'll make a pattern alterations for a protruding rear that shifts the skirt up.